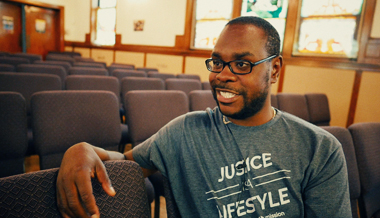 Jonathan serves as Senior Pastor at Canaan Community Church in West Englewood and has taught elementary education and Arts in inner city Chicago for over a decade. As a firm believer in investing in the community he grew up in, Jonathan has a deep desire to impress this virtue on the students and young people in his congregation, classroom and community. Along with numerous blogs and articles he has contributed to two books "Banned Questions for Christians" by Christian Piatt and "Making Neighborhoods Whole" by John Perkins and Wayne Gordon. Canaan just released their debut gospel album called "Recommend Jesus" to be used as an avenue to share faith as an integral component in community transformation. Lastly, Pastah J has also recorded four hip-hop albums with the group Out-World and is currently working on his solo project titled "Can I Get an Amen". Jonathan Brooks on what presence and place have to do with salvation. Jonathan Brooks' thoughts on worship. Love is not a buzz word. Jonathan Brooks' thoughts on the role of the church. Jonathan Brooks on the church being present and following others in the community.